That fate led me to meet with Dragana Trifkovic is not an accident. Dragana, who is a bright and bold Serbian politician, political scientist, and leader of public opinion, repeatedly came to Donbass, despite ongoing hostilities, in order to assist by word and deed. The foundation of her clear political position is the unity and solidarity of the Slavic world and a fierce rejection of Western intervention in others’ affairs. She is especially hostile towards NATO interventions, one of which, with the support of European structures, destroyed Yugoslavia and brought war and woe to her land. The most ruthless strike was inflicted on Serbia. Now, Europe has come to reap the benefits of being shackled in the wake of the American course. Dragana Trifkovic’s point of view is extremely interesting in light of events happening in Donbass and the world. Marina Kharkova: How do the people of Serbia and Serbian politicians react to the war being waged by Ukraine against Donbass? 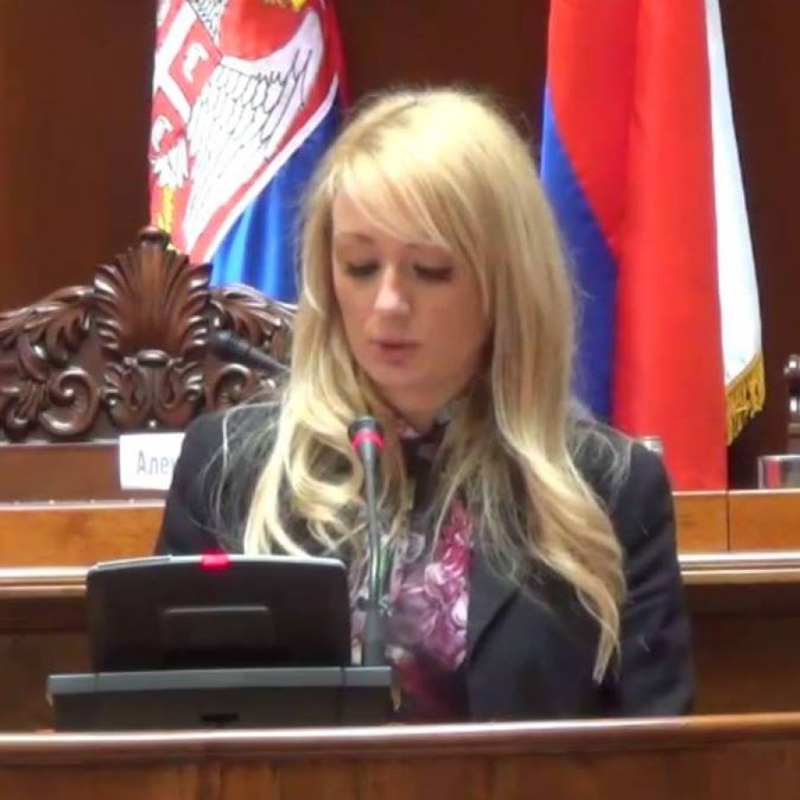 Dragana Trifkovic: The people of Serbia sympathize with the Russian people in Donbass because we know, from personal experience, what you are going through. There are many parallels between the war in Yugoslavia and the war in Ukraine. In both cases, war is imposed from outside, and the reasons are political, not ethnic, in nature. The US has used the same script for many years, creating havoc throughout the world. Color Revolutions, snipers who shoot at crowds, special operations, information war – the Americans have harnessed all of these skills brilliantly. Speaking of “Americans,” of course, I mean the political elite and not the American people. It is difficult for Serbs to look at the suffering of Russian people; we simply cannot watch the injustice that is happening in Donbass. The fratricidal war must be stopped. Part of the Ukrainian people, having succumbed to the manipulations of the West, has blamed all that is happening on Russia and the Kremlin without giving any conclusive evidence. I am convinced that, one day, people will look at this conflict with different eyes, if they manage to free themselves from the influence of Western propaganda. And I’m sure this will happen. As far as Serbian politicians are concerned, the situation is quite different. They are under the control of Washington and Brussels, and are not elected to serve the interests of the Serbian people, but rather to realize benefits for others. For this reason, they “argue” about the Ukrainian conflict in a different manner than a large portion of the Serbian people. Is there information about the war in Donbass in Serbia and do people learn the truth? Serbian media is under the full control of the West. Besides the online portal Sputnik and several patriotic Serbian and Russian websites, we have neither Russian nor domestic media. Therefore, the Serbian media transmits information received from Western sources. In turn, this news is clearly contrary to the truth and does not reflect the real situation in Ukraine and Donbass, and most of this comes from anti-Russian sentiment. What is the attitude towards the Serbian volunteers who are protecting people in Donbass? The Serbian people support the volunteers in Donbass and feel a sense of duty to the Russian people, who always came to our rescue in times of need. Throughout history, Serbs and Russians have always helped each other in wars. The Serbian authorities have done everything in order to return the Serbs who voluntarily went to fight in Novorossiya, and have condemned them. Under the influence of foreign embassies, Serbian authorities have changed the law, calling Serbian volunteers “terrorists,” and threatening them with 2 to 10 years of imprisonment. For many years, Muslims from Serbia, Kosovo, Metohija, and the Raska region have gone to Iraq and Syria to fight for American interests. However, Serbian authorities weren’t concerned by this – they are concerned only by the Serbian volunteers who are helping the fraternal Russian people. Serbian volunteers who returned from Donbass to Syria were tried for participating in fighting, and now in Serbia they cannot fully exercise their rights and in general they face serious problems. Is it easy for Serbia to live in the European Union? Serbia is a candidate for the European Union. Meanwhile, the European Union decided that no reception of new members will be carried out until 2020, and what will happen by this time is a big question. For many years already, the EU has experienced serious economic and political difficulties, the outcome of which is difficult to predict. For almost 15 years Serbia has been in the process of EU integration, and during this time has been weakened in many areas, especially in the economy. Serbia has lost political sovereignty, and the country is now under the control of the IMF, which makes vital decisions. The EU currently has a high unemployment rate, and now there is a serious problem with migrants. I am convinced that Serbia will never become a member of the EU, and such an order of things appeals to me. How many refugees from Syria, Libya, and Ukraine are fleeing to Serbia? What is the attitude towards the flow of refugees? Over the past few months, we have faced a large wave of migrants from the Middle East. Serbia is a transit country, not a destination. We have no strategy for containing refugees and for Serbia it is a heavy load. Serbia is not even able to provide a decent life for many of its citizens, and for many years it has been this way. We are faced with an outflow of young people who are looking for better living conditions. Our people are very humane towards refugees. We ourselves have experienced great suffering, wars, bombings, and we’ve experienced the aggression and destruction of American democracy. The aggressive interventionist policies of the US and EU have created deep and long-term problems, and are responsible for today’s historically significant migration processes. Washington and Brussels should be responsible for the problems posed by migration flows and assistance to migrants. For Serbia, there is the danger that power structures will fall under the dictates of Washington and Brussels, who insist that Serbia receive a certain number of refugees. However, this is impossible for Serbia given the reasons listed above. According to the Serbian volunteers, the Dayton Peace Negotiations, in due time, led to the defeat of Serbia. Will the Minsk talks yield similar conditions for Donbass or not? Today, the Dayton agreements represent a success for Serbs, although at the time that they were made, they were received ambiguously. For many years, the US has exerted pressure, trying to seek a review of the Dayton accords, eliminate the rights of Respublika Srpska, and create a unified state under the control of Bosnian Muslims. In turn, anyone defending Serbian national interests is in favor of further implementing the Dayton accords. On the other hand, the state is hastily suiting itself to circumstances which are are governed by Washington, and de-facto it is not functioning. With regards to the Minsk agreements, the circumstances here are very similar, and again the United States plays an important role. They are realizing their interests primarily through their intermediaries in the form of the Kiev authorities. The truce remains only on paper. I personally witnessed violations of the Minsk agreements by the Ukrainian army, which continued fighting. It is necessary to once again appeal to the responsibility of the EU, especially Germany and France, who, together with Russia, were the guarantors of the implementation of these agreements. I haven’t heard any condemnations from the Germans or French of the Ukrainian army for its repeated attacks on the civilian population of Donbass, which testifies to their extreme irresponsibility. At the time when war was imposed on Yugoslavia, global circumstances were quite different than now. At the time, the situation for Serbs was extremely unfavorable, and the result of events was that the Serbs were blamed for having unleashed all the conflicts in former Yugoslavia. Although it was the Serbs who were most affected in these conflicts. The Serbs always sought to maintain the unified state in which we then lived peacefully with other peoples. However, the geopolitical interests of the US and our desire to preserve stability in the Balkans contradicted each other. I think that, in today’s environment, in which the United States is not the only force which dictates its rules, it is already impossible for it to spread its influence everywhere. I support the people who live in Donbass, because democracy is not the imposition of foreign rules. Real democracy is the will of the people. You yourselves know what decision is best for you. You were in Donbass during the referendum. What are your impressions of the people and cities of Donbass? I was present at the elections in Donbass in November, 2014 as an international observer. I also visited in May for the conference “Donbass- Yesterday, Today, Tomorrow.” The first time, I visited Lugansk and the surrounding areas that were on the front line, and the second time, Donetsk and the surrounding region. During the first visit, I felt the human suffering induced by the war. Communicating with the public, I learned how they survived the fierce military conflict that lasted all summer. The people weren’t inclined to go into the intricacies of politics. For them, it was who was shooting them and who was helping them. Humanitarian aid arrives from Russia. When I visited Donbass for the second time, the atmosphere was significantly different. I think that Donbass would have been able to overcome the chaos in which it is now if they self-organized new structures and took thinks under their control. I mean defense and logistics, and everything else that is necessary for normal functioning and human livelihood in such circumstances. However, I felt a new surge of energy, determination, and judgement. I was under the impression that the people don’t want to be under the control of a state which sends the army at them. At least not in the case in which the government is controlled by authorities manipulated by Washington. We are now seeing a growing discontent with this power in Kiev itself. Regarding the impressions I had of the cities, besides the images of war, the beautiful landscape and bright colors, with lots of greenery and flowers, and a kind of internal harmony which protects people from the feeling of total war – these things remain in my memory. Are there parallels between the war in Donbass and the war against Serbia by NATO forces? I’ve already said that the conflicts in Yugoslavia and Ukraine have much in common. First and foremost, the war is imposed from outside, and it only satisfies the US which, in the end, itself imposed the war. For people in Ukraine, it is important to understand that this war is not of an ethnic, but political nature, and their politicians do not serve the interests of the Ukrainian people, but the interests of Washington. On this basis, it is very easy and logical to explain the events taking place there. Unfortunately, people believe more from television than their own eyes, and the camera today is a lethal weapon. It was exactly the same in the situation when, with the help of the media and US special operations carried out according to their military plans, all the blame was shouldered by Serbia. Responsibility was passed on to the people who suffered the most. Having succumbed to the manipulations of the “Euromaidan”, Ukraine doesn’t understand that there is a big difference when you are struggling for freedom and when you are struggling to become a slave. Do you believe that instead of a unipolar world, a multipolar world is coming and Russia will manage to curb the global policeman, the United States? I believe that a unipolar world doesn’t exist anymore, and that we are now living through a period of transformation of the unipolar world into a multipolar one. This is an irreversible process which the US is trying to stop. Russia is the leader in this process and it, along with the others of BRICS, stands for the restoration of the world oder that was disrupted by the collapse of the USSR and the foreign policy strategy of the United States which manifested soon after this event. Russia again bears the responsibility for the liberation of the world from the dark ideology of Washington-based bombing, destruction, seizure of foreign resources, and the spread of disorder. I’d say that it is even more responsibility than seventy years ago when the Russians defeated the Nazis. All freedom-loving people in Europe and the world believe in Russia. She is the one who will be able to create a new system of values and a framework for international relations. The Serbs, in particular, look at Russia with hope for salvation. I believe that, after a long period of instability, the situation will return to normal in the end. US Puppet Navalny Plans to Crash Moscow Marathon?